This is the "connoisseur" set: you demand the full, immersive experience, complete with four pillowcases... since the additional pillowcases always make a bed look more finished and welcoming. For ease of convenience, we have put it all together. 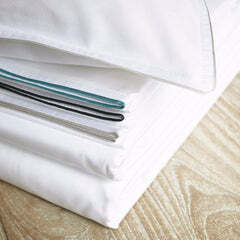 (A flat sheet - which can be purchased separately - can also give you the choice of changing the top sheet rather than the duvet cover or a lighter option for the summer). Did you know? All our duvet covers come with a "French tail" which means you tuck the tail end of the duvet cover under your mattress ...to keep your duvet in place all night or to prevent anyone else from snatching it away in the night! No more fiddly buttons.. 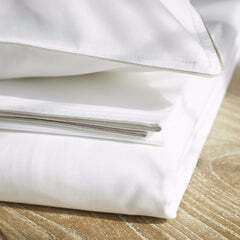 Simply choose the trim colour for your pillowcases, your bed size... and you are on your way! 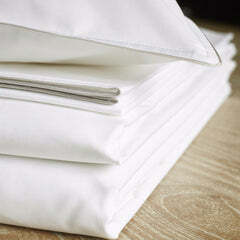 If you have never experienced great bed linen...you have taken a first big step towards a life-long, rather enjoyable pursuit.